I like the list. However, for aggro it is too slow - your manacurve is very steep, yet you have no ramp whatsoever. One land per turn will leave you snailing behind. First, i suggest removing non-basic taplands. If you run budget, dont bother with them, if you have extra, consider Nykthos, Shrine to Nyx - it is great in nonocolor deck. Second, artifact ramp. Wayfarer's Bauble , Mind's Eye , Fire Diamond , Sol Ring , Fractured Powerstone - you name it. If it costs 0, 1 or 2 and gives you at least 1 mana, you must have it. Third, consider cutting creatures. At no point in time your opponents will let you have full board. 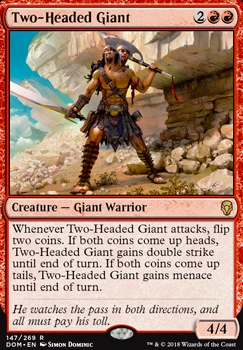 Two-Headed Giant , for example, is at least non-synergistic. Instead, add enchantments that give haste and trample. 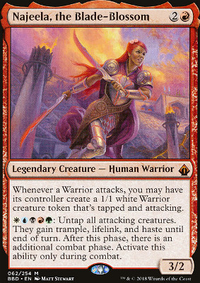 Fourth, point removal and commander protection. It is more important than you think. Forget about Blood Moon , you are not running stax, you need to beat face. Fifth, tribal stuff. Metallic Mimic , Coat of Arms , Stoneforge Masterwork . Too important to ignore. And lastly, sixth. How will you deal with boardwipes? 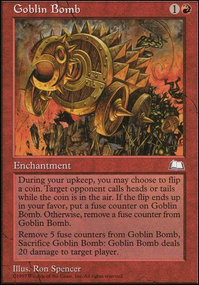 Get yourself Cauldron of Souls or something similar to prevent your opponent from being a jerk. poorpinkus on Okaun Zndrsplt Flip a Coin! 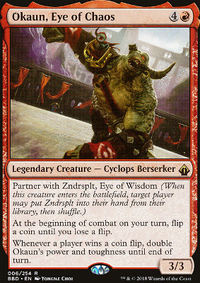 Zndrsplt and Okaum are my favourite commanders to pilot, I have my own deck and it's the most fun that I've had in EDH. 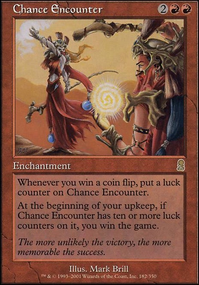 Two-Headed Giant and Mana Clash don't actually trigger Zndrsplt or Okaum because those coin flips aren't technically "won". Puppet's Verdict is incredibly fun to play, and it's a great way to either make a comeback when you're behind or as a last-ditch attempt to survive. 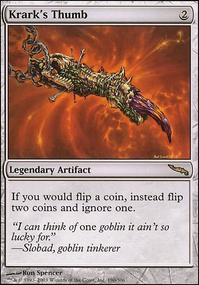 It's essentially a 3-mana instant speed half-boardwipe, and it works even better with Krark's Thumb. Marchesa's Smuggler can give unblockable and haste which can be quite useful. Impulsive Maneuvers is a great way to transition from attacking into playing control, since it gives you a 50/50 chance to draw a card for each creature that attacks whatsoever. 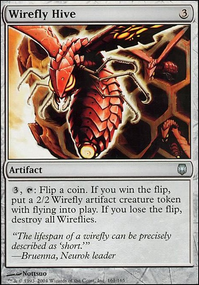 It also combos quite well with Chandra's Ignition and Fling effects when used with Okaum. Strionic Resonator lets you flip even more coins. Assault Suit lets you pass Okaum around, essentially letting you play group slug, meanwhile you can sit back and draw cards with Zndrsplt. Possibly Two-Headed Giant instead of Bloodfray Giant? Lop, Nature's Charmer has hexproof as long as you control at least two legendary lands or legendary enchantments. : The next time a creature token would enter the battlefield under your control, make an additional copy of it. : If a spell or ability you control would be countered, that spell or ability gains hexproof until end of turn. "All things happen. It is merely our perception of events that change." Whenever Bat-Man attacks, create a 1/1 black Bat creature token with Fear. At the beginning of your Upkeep, if you control five or more Bats, create a 1/1 black Bat creature token with Fear. : Bats you control gain Lifelink until end of turn. This design is a bit of a complex one, so bare with me. Design a Two-Headed Giant creature. That is to say, a creature who is a Giant subtype that has two heads like the card I linked. Now, design a Legendary Creature card for BOTH halves. Those halves have Meld. When you control both distinct halves of the Giant, meld them together into an extremely powerful Giant. For example, if the Giant's name is Ra-Taz, the Formidable, you are to make both Ra and Taz and when they Meld together you get Ra-Taz, the Formidable. You don't have to use that name, btw. Just an example.